Let’s talk about the best ear protection for shooting. We’re going to look at all the technical features you would want in a pair of passive earmuffs or active noise reduction headsets. Passive ear muffs require no batteries and protect your ears against most loud and intense sounds. But, Active Noise Reduction headsets are available that are more pleasant to use – especially for long durations. Those Active Noise Reduction headsets protect your ears just as well as passive devices too. 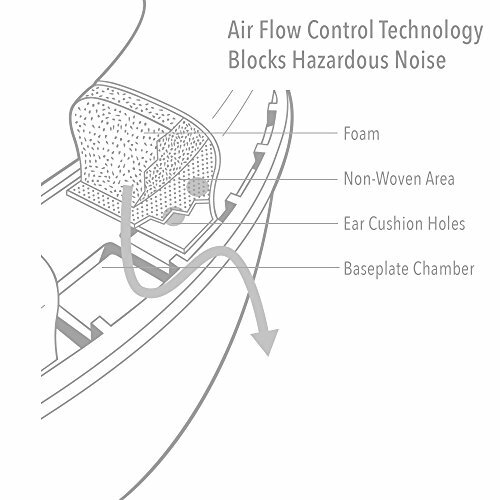 Before we start, let’s make sure you understand the basic terminology related to hearing protection. Here’s some things to look for in the best ear protection for shooting. In the year 2019, there’s really no reason to use old-fashioned ear plugs and passive earmuffs. Active Noise Reduction is cheap and plentiful – and it works great. These amazing electronic devices incorporate microphones – and these can be used to amplify ambient sounds you want to hear – while still instantly cutting off and protecting you from loud gunshots or other noise hazards. Using electronic shooting headsets mean less fatigue, better communications, and less chance of errors and problems. The downside is they do cost quite a bit more than a pair of ear plugs or passive earmuffs. But after you look at all the advantages, I think you’ll agree: the upsides far outweigh the downsides – especially if you shoot a lot. So, based on the above, we’re largely going to look at electronic shooting and safety ear protection headsets. What are some other useful things to look for in these devices? It’s a plus if you can use rechargeable batteries – otherwise you may feel like you are endlessly flushing money down the drain by replacing single use batteries. For convenience, some of tese are rechargeable via a USB connection – so they’ll work where ever you have a plug and a phone charger or similar device. Some of these are Bluetooth compatible as well – which means you can listen to music or other audio. What is Active Noise Reduction? Let’s focus on Active Noise Reduction for a moment. There are two benefits to this. First of all, the mics can give you directional sound and amplify the sounds you want to hear – your team mates, co-workers, and sounds that aren’t intense enough to damage your hearing. This greatly helps reduce the fatigue involved with wearing old-fashioned over the ear safety ear muffs. But more importantly the electronic circuits can react more quickly than sound travels – and that means when dangerous sound levels are detected, the circuits cut off the sound before it reaches your ears. And this means the device then acts like a passive safety ear muff – with the clamshell, over the ear design ensuring that dangerous sound levels can’t reach your ear drums. Both types of devices (passive or active) use dense acoustic foam and other advanced materials to shield you from the intense sound waves. How much noise reduction is provided? To quantify that, we need to understand decibels. Sound intensity, or sound pressure, is measured in decibels. Decibels aren’t on a linear scale – it is a logarithmic scale. What this means is that a 30 dB sound is actually TWICE as loud as a 20 dB sound. You will find many headsets and ear muffs ranging from 20 dB of sound reduction to 34 or 35 dB of sound reduction. And by the way, an average gunshot is over 150 dB in sound pressure. Sounds over 85 dB can cause hearing loss over the long term. The amount of noise reduction a headset can provide is known as the Noise Reduction Rating, often abbreviated as NRR. And while it’s true that the testing process used by manufacturers can vary – generally speaking you want a set of ear muffs or headset with more dB of noise reduction rather than less. You also have to be wearing the headset or earmuffs correctly to get the benefit of the noise reduction. How do you know what sort of NRR you need? 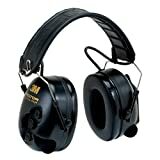 These safety ear muffs and headsets we will review here should be good for shooting and most industrial situations. Having said that – there are legitimate reasons to double up on your ear protection – using both an Active Noise Reduction set and more. Are you shooting inside or outside? Shooting inside is a LOT louder – because the sound is more contained within the walls of a structure – and that means your ears are subjected to much more intense sound. 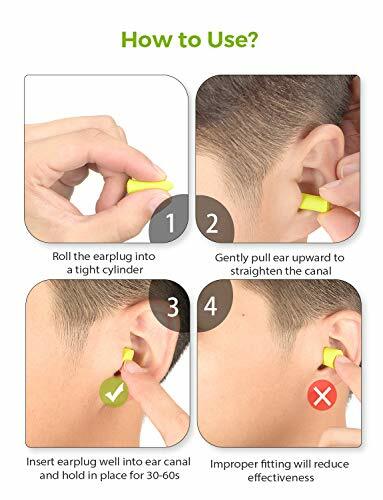 Therefore, if you are shooting within small closed rooms – consider adding ear plugs also – in addition to the electronic ear muffs we’ll cover here. 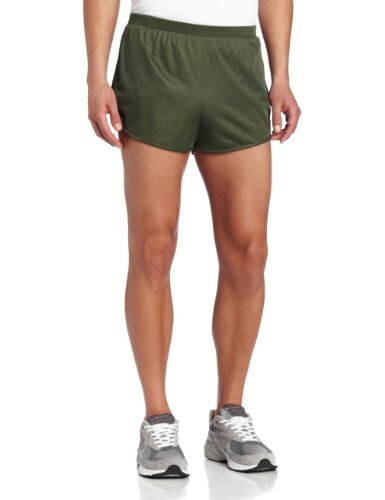 Similarly, if you are wearing these items as an industrial safety device – consider where the noise will be – inside or out. These devices aren’t just for shooters – anyone that works in loud, noisy environments can benefit. This includes airport workers, welders, heavy equipment operators, and anyone that works in an industrial environment. 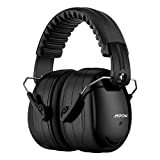 The Mpow 035 Noise Reduction Safety Ear Muffs (Buy on Amazon) is our top pick for a budget passive earmuff. This ear muff will work every time you need it – no batteries needed. It provides 28 dB of Noise Reduction. NRR SOUND TECHNOLOGY: Designed with 2 layers of professional noise dampening foam, high sealing solid cup and the unique double-shell, the ear muffs offer a high SNR of 34dB for noise cancelling. ANSI S3.19 & CE EN352-1 CERTIFIED: Lab tested and certified to US and European standards. Professional ear defenders for hunting season or shooting at the gun range. ADJUSTABLE HEADBAND DESIGN: Designed with retractable stainless steel at the end of headband, the ear muffs can be adjusted to fit all sizes. COMPACT AND PORTABLE: Our lightweight ear muffs feature a foldable style as the ear cups collapse into the headband. Travel drawstring bag included for ease of packing them or to neatly store away, dust-free. SILENCE YOUR WORLD: Ideal for shooting, hunting, sports events, concerts, festivals, studying and operating machinery to protect hearing, especially suitable for work in construction and landscaping work. Remember we said that in some situations you may want to team up ear muffs or headsets AND ear plugs? 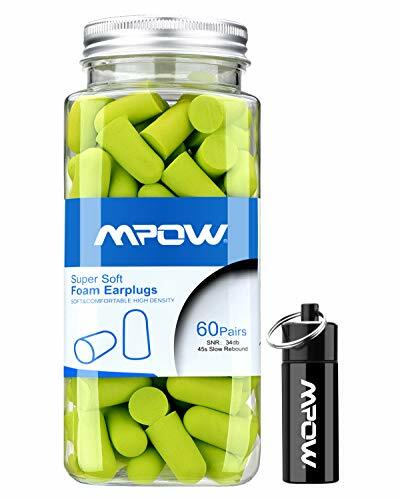 Use the Mpow Ear Plugs (Buy on Amazon) for just those situations. These are disposable (and cheap), so get a bunch. Nobody likes to re-use ear plugs. Don’t know what to do with these? Take a look here. If you somehow manage to put them in correctly you’ll get 32 dB of noise reduction. Let’s get back to over the ear muffs. I don’t like stick things in my ear. 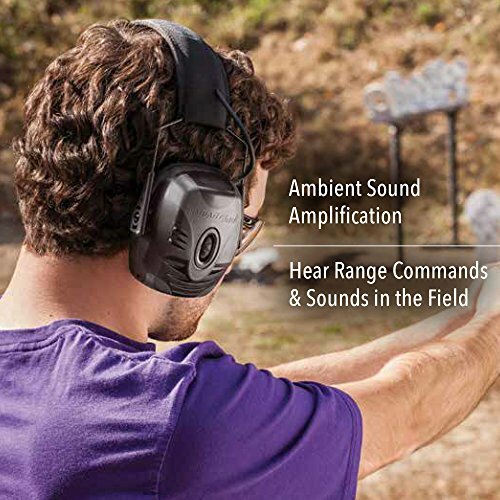 The Impact Pro Sound Amplification Electronic Shooting Earmuff (Buy on Amazon) is an electronic powered earmuff with Active Noise Reduction. These are high quality earmuffs, from a quality manufacturer. These use 2 AAA batteries. They have an auto-shutoff feature – which helps a lot with battery life in case you accidentally leave them on. Battery life is claimed to be 350 hours. 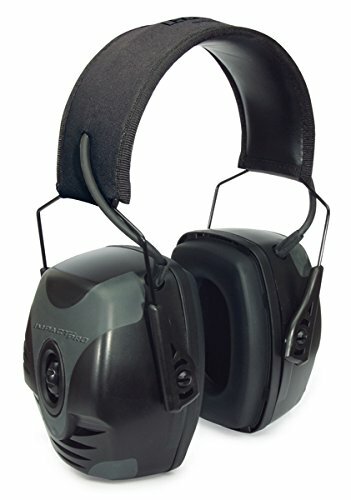 The 3M Peltor TacticalPro Communications Headset MT15H7F (Buy on Amazon) would be great for shooters, but also excellent for heavy equipment operators, airport workers, and industrial workers. They have the dual microphones and the Active Noise Reduction you’d expect. These also have an audio jack for radio connections. Yes, but this is a very high quality product. These use 2 AA batteries. You can see the dual mics well in this view. The 3M PELTOR TEP-100 Tactical Digital Earplug Kit (Buy on Amazon) is our only option for those that prefer earplugs to “over the ear” headsets. These are some of the best ear plugs available. 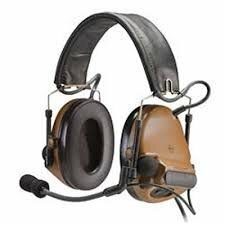 But please note that these will inherently not provide as much sound protection as an over the ear headset or ear muff. The Peltor ComTac Electronic Headset (Buy on Amazon) is “operator” quality tactical headset. The 3M Peltor ComTac III Electronic Headset has it all, and a boom mic for use with a radio. These meet DA PAM 40-501 Army Hearing Conservation Program requirements. They are popular with the military and LEOs. Two AAA batteries will give you approx. 500 hours of use. In summary, there are several ways to protect your ears and hearing when shooting. Ear plugs and passive earmuffs are an option. They are cheap, reliable, and will work when you need them to. But, electronically powered Active Noise Reduction headsets are cheap and reliable too. They will require you to power them (swapping batteries, etc.) and they tend to be heavier, but they offer lots of compelling advantages. They can help lessen the fatigue of wearing hearing protection for long durations – whether on the firing range or the job site. And, for those that need a radio compatible tactical communications option they can be had with boom microphones and radio jacks. 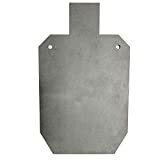 Team Wendy makes great ballistic helmets - like the EXFIL Ballistic shown here We look at what you need in a good ballsistic helmet - find out what the best gear is for 2019.